Perfect for business cards, book covers, menus, presentation folders, packaging, bookmarks and postcards. Celloglazing is a trade term for laminating. It involves a thin sheet of plastic film, fixed to either one or both sides of a printed sheet of heavy-ish paper stock with heat activated glue and pressure. Celloglazing comes in gloss or matt finishes and is an all or nothing process. That is, the whole page must go through the machine. Sections of a page can’t be left unlaminated. Firstly, with its flush to the edges finish celloglazing pushes the attractiveness of the product up into the stratosphere! Gloss cello intensifies the colour, making it richer and more vibrant. Matt cello confers a satiny, soft, tactile quality to the print job for an understated yet high end look. Secondly, with the extra layer of protection, celloglazing adds durability to the job. Here’s a pic of our largest celloglazing machine. It can apply laminating film to both sides of the sheets in one pass! Although we much prefer the look of a cello glazed job to non cello, it’s not for everything. Here are some considerations. 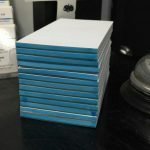 Celloglazing is not recommended for paper stocks under 170gsm as lighter weights can tend to crease during the laminating process. Heavier stock is better. By nature of its silky finish, matt cello can tend to mute colours. So if colour vibrancy for logos etc. is crucial, use gloss cello. 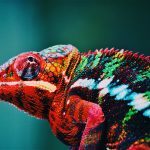 Scuffs and scratches are more inclined to show up on solid blocks of dark coloured printing with a matt coating, but with our SCUFF FREE option, that problem is solved! Generally speaking, if you need to write on your job, don’t use gloss celloglaze. It’s virtually impossible except with a marker or texta. A matt finish makes writing easier. We recommend you leave the job unglazed if the capacity to write is critical, such as for appointment cards and so on. Although celloglazed prints are long lasting, because they are flush cut, the glazing isn’t sealed at the edge of the print job, so the paper is not completely protected. Dirt and moisture in the surroundings can creep in over time and the printed items will eventually succumb to wear and tear. 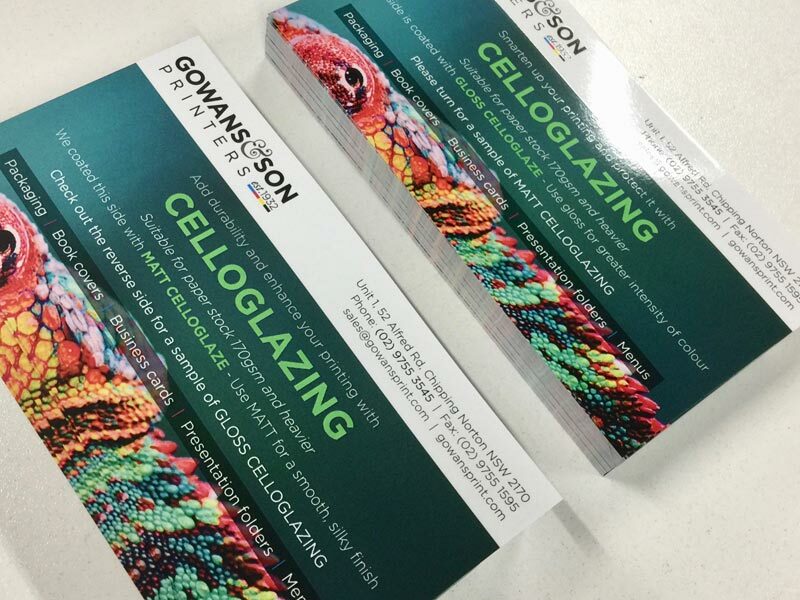 Enhance your printing with celloglaze! A celloglazed print job is definitely a smarter looking, high end print job, not to mention a longer lasting product! 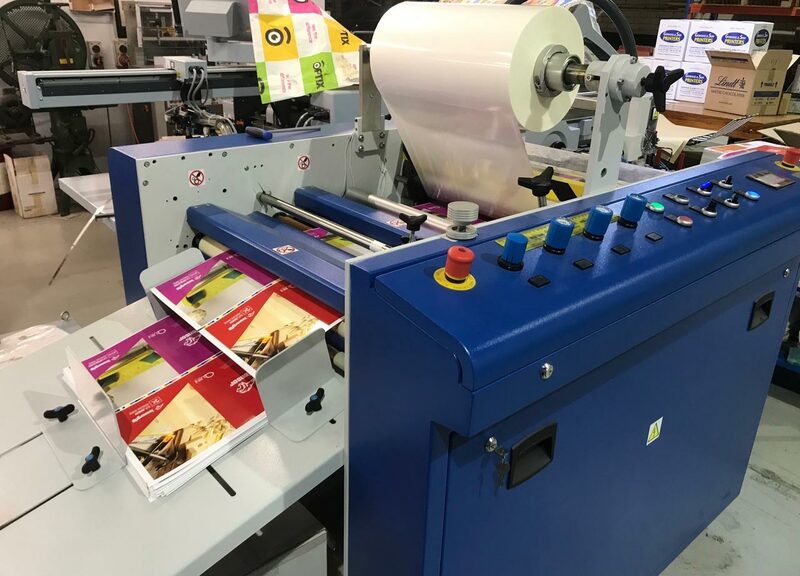 It’s suitable for application on one or both sides of paper stock weighing over 170gsm, in either of our digital or offset print processes. We have three different size celloglazing machines in house at Gowans & Son. Whatever your celloglaze laminating need, we can handle it! Want a price for your celloglazed printing? Get in touch! Check out our celloglazing machine in the video below!